Magic tells the story of Corky Withers, an amateur magician who stumbles into fame once he augments his card tricks routine with Fats, a wisecracking dummy. Anthony Hopkins plays both Corky and Fats, which is damned impressive when you considering not only the difficulty of effective ventriloquism but the funny/creepy nature of the dummy’s voice; imagine Mel Blanc’s Bugs Bunny possessed by a libidinous demon. When the pressure of greater fame proves too much to bear, Corky runs away to find his high school crush, Peggy Ann Snow, played by Ann Margaret (who had clearly come a long way acting-wise since her early days in 60′s Elvis Presley flicks). As the story progresses, the line between performance and reality gets blurry for Corky; it’s never clear just how much he needs Fats in his life. We hear a lot of back and forth between man and dummy and the man doesn’t always win the argument. That isn’t a good thing when the dummy has murder in mind. Yet while Magic does provide some serious chills, those expecting a kill-filled slashathon must have been disappointed when the film came out, because the murders are few and far between. 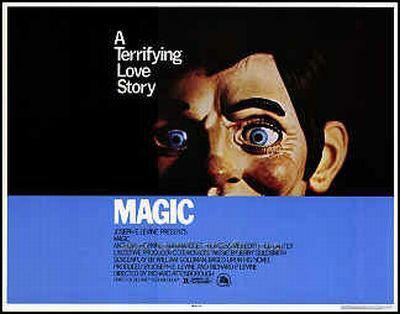 Magic was billed as a terrifying love story, and for once the tagline tells the truth. What you get in this film is a story of two people trying to sort out their unfulfilled, complicated lives and find their way to being together, and the acting is strong enough to make you root for them. It’s just that one of the complications keeping them apart is a dummy that may or may not be a murderous extension of our hero’s mental illness. The fact that Magic was neither a straight horror film or a straight character-driven romance was probably what kept it from reaching a larger audience when it was first released. But that is also what makes it such a respected cult classic today. I have study few of the blog posts on your web site since yesterday, and I really like your way of blogging. I added it to my bookmark web site list and will be checking back soon. Please check out my internet site also and let me know what you think. Very efficiently written story. It will be valuable to anybody who employess it, as well as yours truly :). Keep doing what you are doing – looking forward to more posts. I was very pleased to search out this site.I wished to thank you for this great read!! I definitely enjoying each little bit of it and I’ve you bookmarked to take a look at new stuff you post. Why Do We Need Insurance?Many of us have never had to make a claim on our insurance. Therefore when we continue to write the check month after month, we feel as if we are pouring money right down the drain. Even though you’ve never had to make a claim on your insurance, there is a good reason that its there. Naturally insurance is there to protect yourself and your investment, but let’s face it; many of us wouldn’t bother with insurance if it wasn’t required by law or the bank. This seems a very active website. How on earth do you manage to keep up with filtering out all the comments? I really like the whey this blog is written, great job! Hey there I must say I revere your . As a Boston Cab driver I meet all kinds of fun people and now I just can`t get enough. As soon as I drop off my Boston Taxi I come right and fire up my pc looking for entertaining and informative blogs like this one. The next time you are around zip code 02127 Southie Mass.stop by and see us! Thanks for taking the time to write this article. It is always fun to read someones perspective. I need to make a priority to return and explore the otherof the site. thanks.